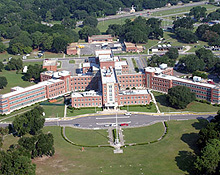 Naval Hospital, Beaufort was opened in 1949 on 127 acres of land. The present hospital replaced the Naval Hospital, Parris Island which was open from 1891 through 1 May 1949. Naval Hospital, Beaufort was commissioned on 29 April 1949, and the first patient was admitted on 5 May 1949. It's one of the few military facilities which is a complete military compound in itself, rather than a tenant of a larger command. It provides general medical, surgical, and emergency services to all Active Duty Navy and Marine Corps personnel, as well as Retired military personnel and all military dependents residing in the Beaufort area, a total population of approximately 35,000 beneficiaries.